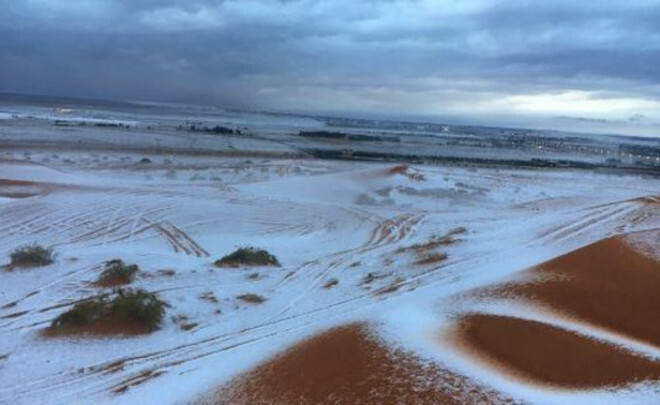 The unusual occurrence is recorded in the center and in the northwest of Saudi Arabia — desert dunes were covered by snow. In the cities of Shakra (the center of the country) and Tabuk (northwest), the thin snow layer has covered the earth. In the city of Tabardzhal (district El-Dzhauf) temperature has fallen to −3 Celsius, and in the province Al-Kurazhat — to −1. Though usually the rainy season comes to an end in Saudi Arabia in the middle of October, in the kingdom a large amount of rainfall still drops out. The surprised locals post on the Internet a set of videos on which the rain and a hail are imprinted. Professor Abdalla al-Musanad, professor of science about climate at University Kassim, told that by the end of the week of draft they will pass in all regions of the western, east and central parts of Saudi Arabia. According to him, it “the second rainy season in this season” though passed more than a month from its termination, transfers Al Arabiya. Municipalities in east cities to Ladies, Dakhrane, Hobare and Katif are ready to involve drainage stations and reservoirs for collection of rain water. Previous story Why we yawn?